So, The CommuniKate Project is about one year old, and it’s been released about three months now, to much more of a pleasant reaction than we expected. A few weeks ago Kate and I sat down in Tibbits with the back of an envelope and worked out where we want to go (AzuleJoe has its own goals, more on that in another post). There are three things: universal formats; different ability versions and, as a pipe dream right now, access beyond hardware. Universal formats is straightforward. If you can buy an AAC device, we want you to be able to use CommuniKate 20 on it. Ideally all the devices would work with something universal like the open board format, and we strongly support that. But it takes a while for manufactures to take those things on so we’ll be developing (and looking to help develop) CommuniKate ports to any AAC device you can name. Giving the users more choice, more security, and easier device switching when they need it is our key goal right now. CommuniKate 20 is designed for users with complex needs. Some users have difficulty with the number of items on the page. In the next year or so you should see CommuniKate 15 released, along with a version of CommuiKate 20 that supports scanning. 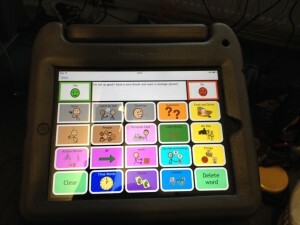 Something that is always surprising to AAC professionals in the UK is that the UK is world leading on AAC. There are a wide range of factors: the national health service, our relative wealth as a country, and even more mundane things like certain examples making the whole setup much more acceptable in the UK for many many years. But the world is a big place and there are people with communication disabilities living all over the world in awful conditions. We’ve posted about communication books before. We’re going to be investigating the possibility of working with some partners working overseas who might be interested in a copyright-free (translated) way of helping people communicate. For the price of one piece of hardware in London we could ship 500 CommuniKate communication books to somewhere that really needed them. To AV or not to AV – that is the petition!